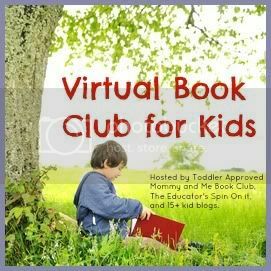 David Shannon is the children's author for the Virtual Book Club this month. Each month the Virtual Book Club for Kids does an author study. We chose to read David Shannon's book, Too Many Toys. In this book, a young boy named Spencer has a common problem of having too many toys. Family, friends, teachers, doctors, and fast food chains keep feeding his toy collection. When his mom starts tripping over toys, she decides to conquer the mound of toys. Spencer turns into lawyer kid and begins negotiating to keep toys. After an exhausting battle, Spencer's mom finally gains some ground and ends up with a box full of toys to give away. As the page turns, though, the toys are shown strewn all over the floor again, as Spencer has found the best toy of all-- a cardboard box! Before we read David Shannon's book "Too Many Toys", I told the boys they would get to discover the world's best toy. I explained that the boy in the story, Spencer, had many toys. We looked through the pictures, and decided he did, indeed, have too many toys. I showed the boys the page where the parents are tripping over toys. We looked at the page that shows the mother's angry expression. The boys agreed that the mom probably wanted Spencer to get rid of some of his toys. Then I told the boys that Spencer was going to get to keep the best toy of all. The boys decided to listen closely to the story to discover the best toy ever. 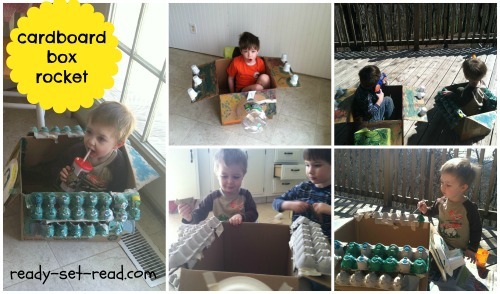 After reading Shannon's book, I showed the boys two cardboard boxes. We discussed what they boys could create. They had lots of ideas but Logan finally decided to create a spaceship like the boy in the book and Tyson decided to create a flying Ninja Turtle. umm, ok. 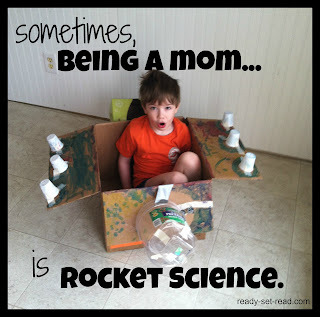 The boys loved making their rocket ships. It was a beautiful day and they took their spaceships on the deck to paint them and play in them. They shot aliens and then cooled off with a snack and milk! In David Shannon's Book, Too Many Toys, the author shows the excess of toys when the main character, Spencer, has a toy parade that stretches across his house. We had a bag of small toys that we were going to get donate. We used yarn to estimate and measure our toy parade. My idea was then to tell them they could choose 4 small toys to keep and donate the rest. (I figured I was WAY smarter than Spencer's mom who negotiated each toy). Unfortunately, my boys turned on me and started working together to grab armfuls of toys to save. It seems, Too Many Toys, a true to life story! Link up your David Shannon book activities. Wow! 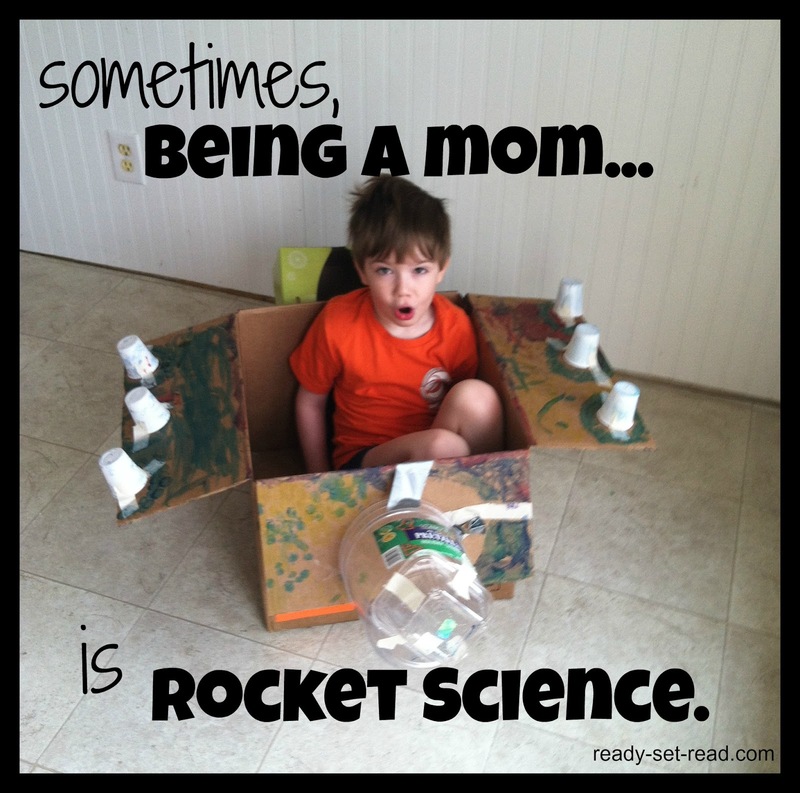 Love those rockets! Amazing! So fun! I love how you added the egg cartons to the exterior of the ship. Very creative! I love the idea of a flying Ninja Turtle! Both boys did a great job. And you are spot on about a box being the best toy ever - I actually have a boy in a box behind me right now! Thanks everyone. We had fun with making the rockets. I even destressed a little that day and painted with the boys! So relaxing. I love that you did a picture walk prior to reading. I think sometimes we forget to do this important step before reading the text. Picture walks really help with building vocabulary, predicting and comprehension. Thanks for the reminder. This is such an awesome idea! I'm constantly threatening my kids that I'm going to give away their toys if they can't pick them up (we actually have put away a lot of them, but it seems I'm still tripping over them). We haven't read this David Shannon book yet, but I'm excited to check it out. It sounds like it teaches some really important lessons. It is a great book! I love how David Shannon captures the emotions of both the adults and the children in the story. It also helps each side to see the viewpoint of the other person, I think.